Just in time for back-to-school! 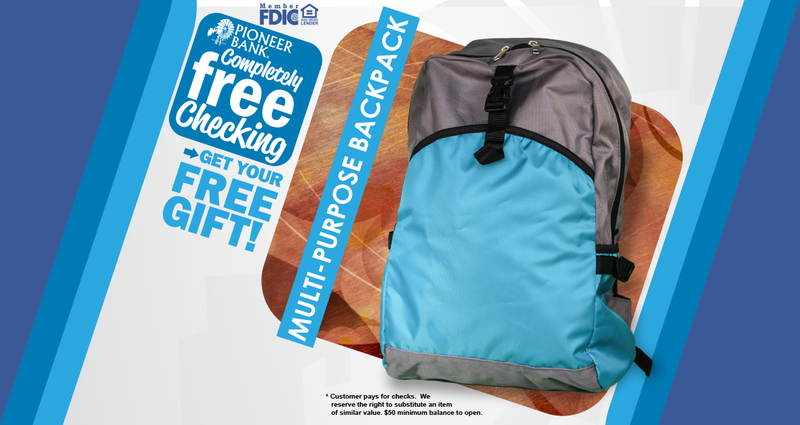 Open a Completely FREE Checking account today and you will get a FREE multi-purpose backpack! Or, tell-a-friend and when they open a checking account, you will both receive a FREE backpack! You can’t miss on a deal like this! FREE checking and a FREE gift! Visit any one of our locations today to open your account and get your FREE backpack! * Customer pays for checks. We reserve the right to substitute an item of similar value. $50 minimum balance to open. See bank representative for details. Other fees, such as NSF, overdraft, sustained overdraft fees, etc. may apply. Tags: ACCOUNT, backpack, checking, free, free gift. Bookmark the permalink.